Having to stand for hours on end to get rid of that huge pile of clothes that need ironing, is time well wasted. We procrastinate for days and weeks before we actually plugin that iron and start the tedious task of pleating, straightening and getting rid of creases. Possessing an iron like the Breville VIN393 Aero will make this chore a little easier and much more comfortable, which is something that all of us should keep in mind when purchasing a new iron. The BrevilleVIN393 Aero Ceramic Steam Iron has the features and ergonomic design that make ironing a little less bothersome. With its lightweight design coming in at 1.4kg and its 2400W power source, the Breville is easy to maneuver and heats up quickly and evenly. It also has good recovery time when changing from different temperatures. The green and white design are appealing to look at and the transparency of the water reservoir is crystal clear. 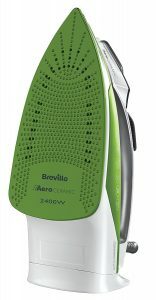 With the Aero Ceramic sole plate containing strategically placed dimples, the Breville VIN393 Aero iron glides easily over any fibers and gives a smooth finish to all of your garments. This iron boasts less friction and static will occur because of the aero ceramic plate so it is ideal to use on any synthetic fabrics like satin and polyester. The overall design of the sole plate offers less drag and gets into those touch to reach spots like corners and pleats quite easily. Compliments of a 2m cord with a 360-degree cable, getting tangled up in your iron is less of an issue, and the 360-degree cable allows for freer movement while ironing. With the soft grip handle, it is easy to hold and won’t cause additional hand pain or callouses from hours of ironing. To add even more convenience, the VIN393 has an easy to read Safe Store colour strip that lets you know when your iron has cooled down enough for storage. No more burning your fingertips to check! In conjunction with the ergonomic and aesthetic features of the VIN393 iron, it has all of the regular features you might need in an iron. Anti-drip technology makes for less water seepage and water spots. The self clean and anti scale function allows you to periodically cleanout any calcium and limescale building so you can preserve the lifespan of the iron. You will also find a 130g steam shot element on this iron. It claims that this will help get into those tough creases on heavier fabrics. A Vertical Steam function also gives extra moisture when needed and seems to work quite well if you are wanting to vertically steam hanging garments. Whether you are wanting to steam or dry iron, this iron seems to have the characteristics you may need. Two of the most interesting features on the VIN393 Aero are the Sure Fill water inlet and the up to temperature illumination. The Sure Fill design claims to be 4 times easier to fill and after doing some research, I would tend to agree! With the placement of the temperature illuminator, you can see clearly (since it is located right on the handle) when your iron is ready to work for you! 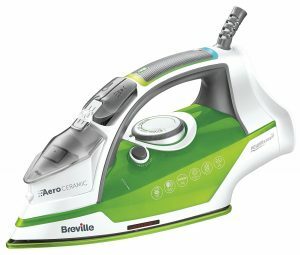 By and large, the Breville VIN393 Aero Ceramic Steam Iron is a sturdy small appliance with an economically price point. It works the way it is supposed to and has very few design or technological flaws. 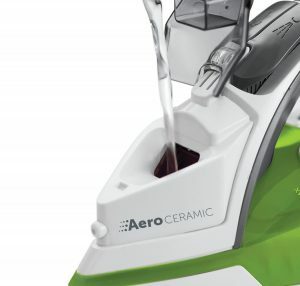 If you are looking for an iron that is comfortable to use and generally eliminates wrinkles and creases, but you don’t want to spend a tonne of money, this iron may be the perfect fit for you.